U.S. Official: Nuclear Crisis Close To 'Stabilizing' The executive director of the U.S. Nuclear Regulatory Commission says Japanese workers are making progress at the troubled Fukushima Dai-ichi power plant. Smoke forced workers to temporarily evacuate Monday — one sign that the situation is far from resolved. Smoke rises from Unit 3 of the tsunami-stricken Fukushima Dai-ichi nuclear power plant in Okumamachi, Fukushima prefecture on March 21. 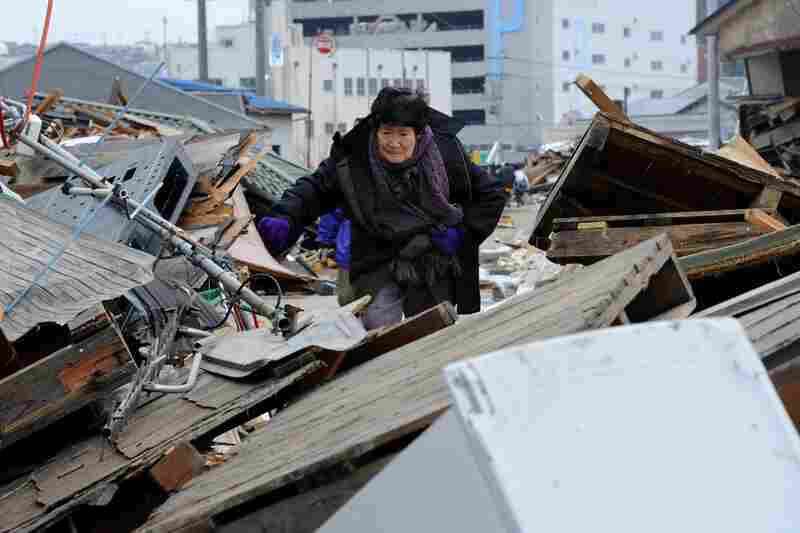 A woman makes her way through piles of debris in Ishinomaki, Miyagi prefecture. 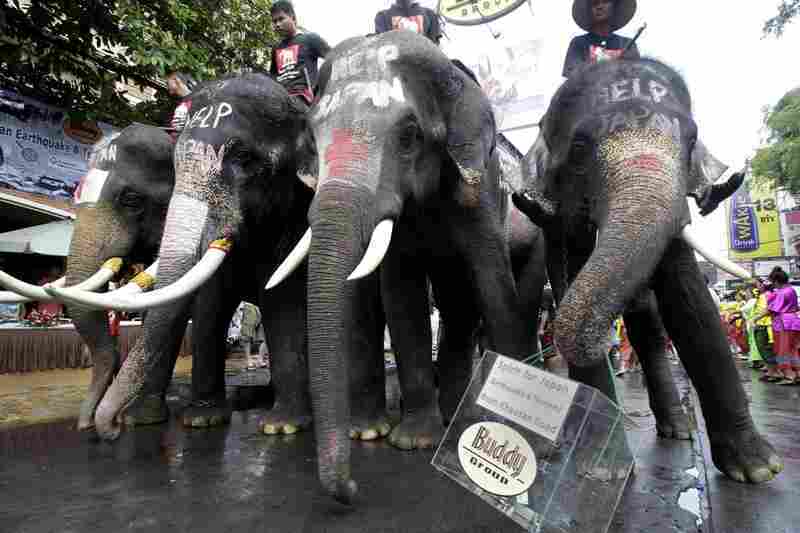 An elephant carries a donation box during a fundraising campaign in Bangkok for victims of the Japan earthquake and tsunami. 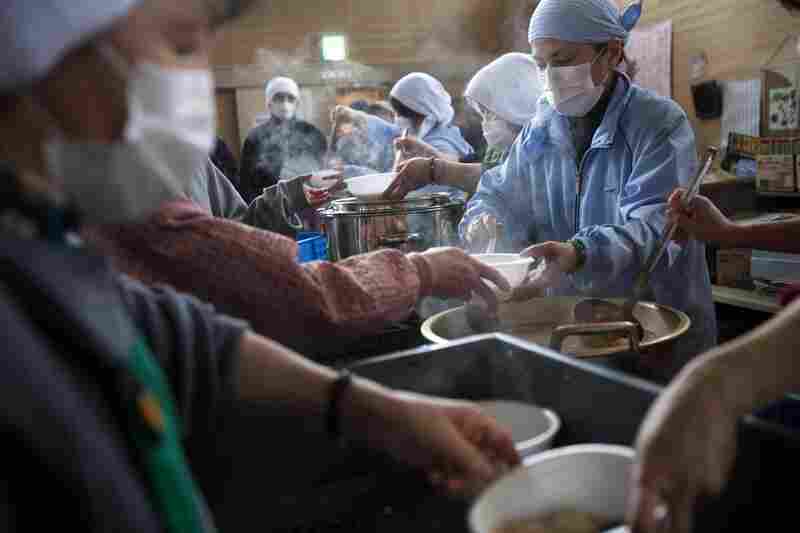 Japanese volunteers serve soup to refugees at a shelter in Rikuzentakata. 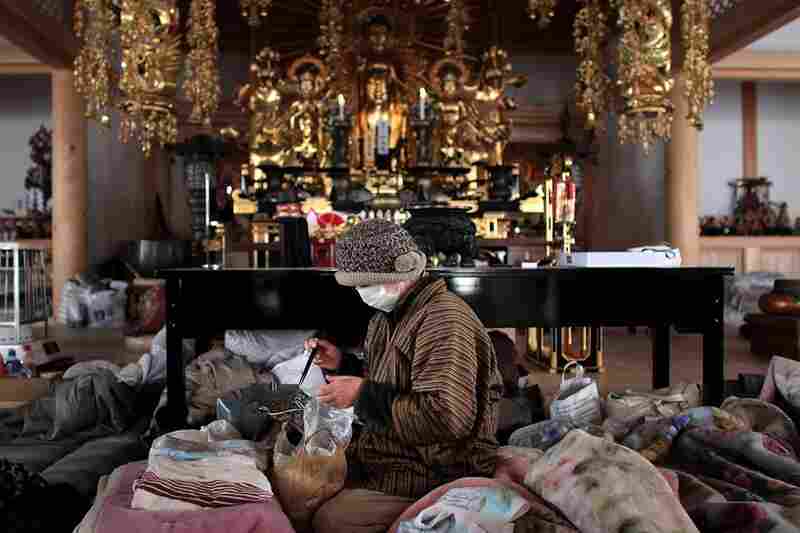 A woman eats noodles in a temple turned evacuation center in Kesennuma. Japanese women watch recovery teams search their home in Rikuzentakata. 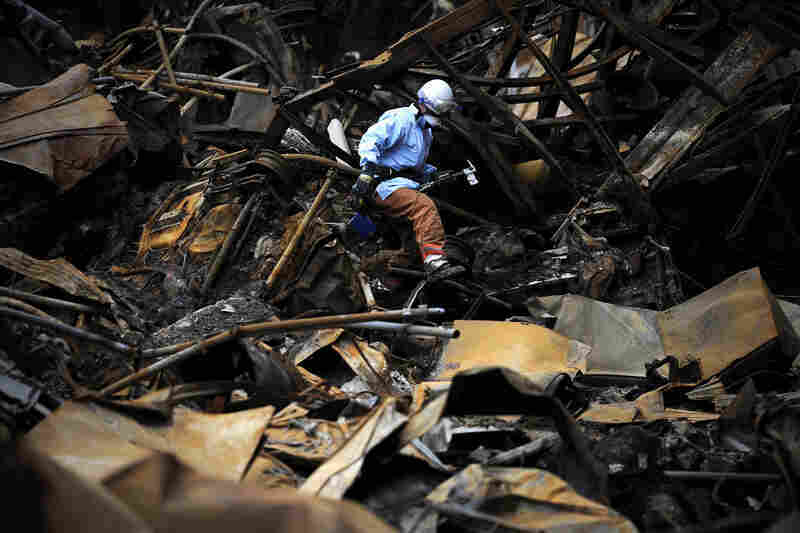 A Japanese fireman searches for bodies in the rubble in Minamisanriku. 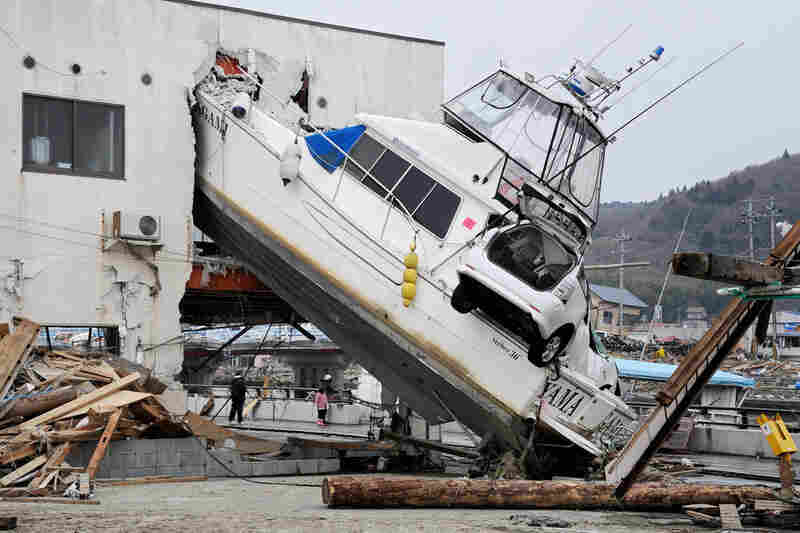 Miyagi prefecture was worst hit by the quake and tsunami, with a confirmed death toll of 4,882 so far. Massive pieces of rubble remain untouched in Ishinomaki, Miyagi prefecture. 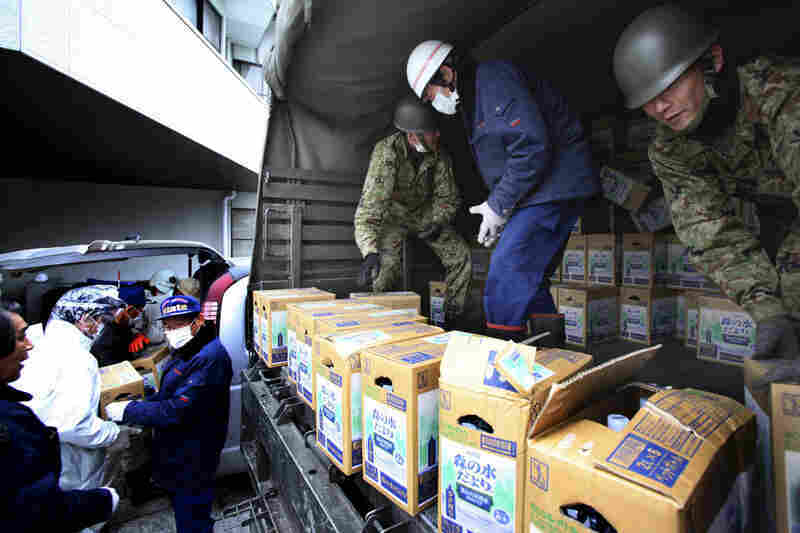 Japanese soldiers unload boxes of drinking water from a truck as relief supplies arrive in Iitate, Fukushima prefecture. The Health Ministry advised residents not to drink tap water because of elevated iodine levels. 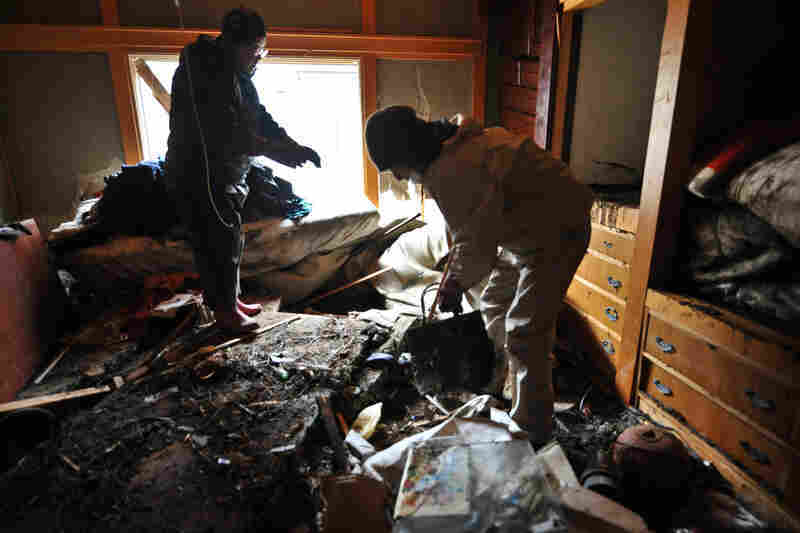 A man and his son clean up their house in the devastated city of Ishinomaki. 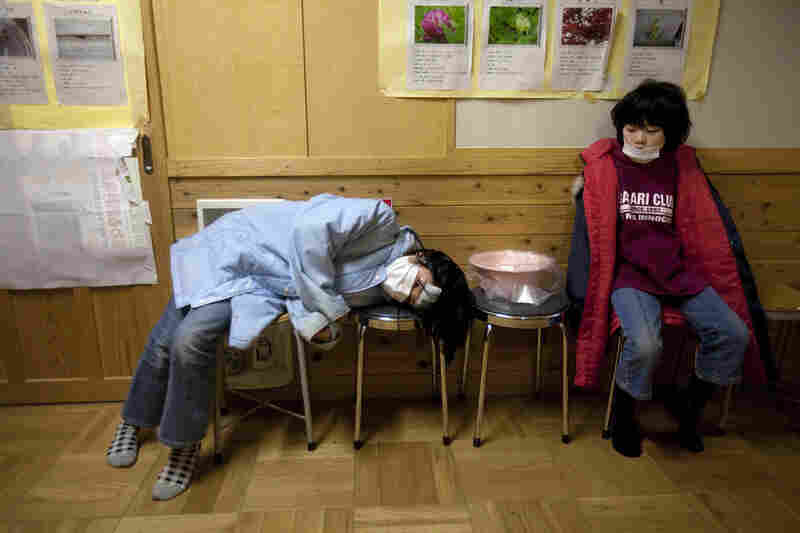 Japanese refugee children wait for medical treatment inside a shelter in Rikuzentakata. Workers prepare for a mass burial planned for Tuesday in Higashimatsushima city. The U.S. Nuclear Regulatory Commission says that Japanese workers are making progress at the troubled Fukushima Dai-ichi nuclear power plant. But regulators warn that other problems may yet be found. "I would say, optimistically, things appear to be on the verge of stabilizing," Bill Borchardt, executive director for operations at the NRC, said at a news briefing Monday. Borchardt's comments followed Monday's temporary evacuation of workers at the plant after the damaged Unit 3 reactor emitted gray smoke for a couple of hours. That slowed ongoing efforts to reconnect power lines and restore cooling systems to stabilize the nuclear complex, which is leaking radiation. The plant, located along Japan's northeastern coast, has been crippled since a devastating earthquake and tsunami struck Japan on March 11, knocking out the facility's electricity and emergency cooling systems. Smoke was seen escaping from the roof of problem-plagued reactor No. 3 for a couple of hours, prompting officials to pull back workers at the plant as radiation levels were assessed. There was no immediate spike in radiation at the complex. White steam also came out of unit 2. Over the past few days, workers have made progress in laying cable to connect reactors 3 and 4 to the power grid. That step is key to restoring cooling systems. But as the NRC's Borchardt warned Monday, it is possible that pumps, valves and electrical cables have been crippled by the string of accidents at the plant. The NRC continues to work with the Japanese to assess the full extent of the damage. Despite progress with repair efforts at the Fukushima plant, new radiation concerns have emerged: The Japanese Ministry of Health, Labor and Welfare has detected both the radioactive isotopes iodine-131 and cesium-137 in leafy vegetables in Ibaraki Prefecture. Officials have banned the sale of vegetables and milk from certain areas. And residents of one village 19 miles northwest of the Fukushima plant have been told not to drink tap water because of signs of contamination. Despite these steps, health officials in Japan continue to insist that the radiation levels in these samples did not pose an immediate health risk. But many residents say they remain confused about what the radiation numbers mean. Meanwhile in Vienna, the head of the International Atomic Energy Agency says the situation in Japan exposes the need to update nuclear safety standards. IAEA director-general Yukiya Amano said he has not doubt the crisis will be overcome. But Amano emphasized that the danger is not over. 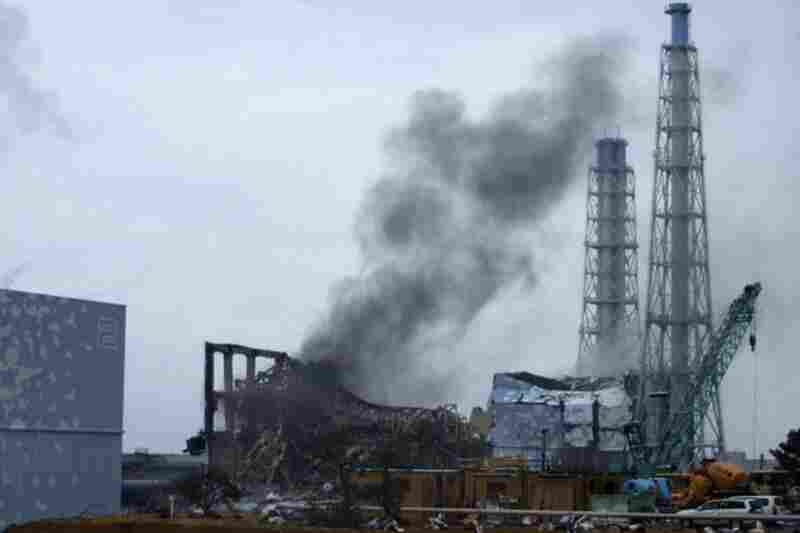 "The overall situation at the Fukushima plant remains very serious," Amano said Monday. "My assessment doesn't change — it continues to be very serious." Japanese Prime Minister Naoto Kan on Monday had to cancel a visit to the nuclear workers because of bad weather. Rain in the area was also complicating relief efforts. Officials said they could not operate relief helicopters until the weather improves. Helicopters are critical, as many roads are still clogged with debris. An estimated 350,000 people are still living in evacuation centers in quake- and tsunami-stricken areas. Around a million households are still without running water. 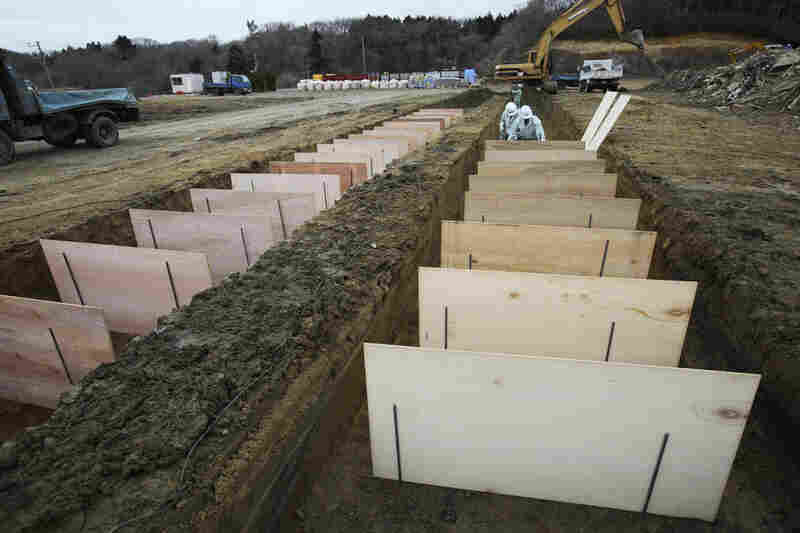 In the coastal city of Rikuzentakata, in northeastern Japan, workers have started construction of 200 temporary housing units for refugees. The provincial government in the area has said it wants to build more than 8,000 homes for evacuees. In the U.S., the Nuclear Regulatory Commission met in Rockville, Md., Monday to discuss the situation in Japan and its significance for the U.S. nuclear industry. The NRC says it will review safety measures for all 104 U.S. reactors. The NRC's Borchardt said he did not see a significant weakness in the ability of domestic reactors to withstand natural disasters.